Boise City, Idaho is a great retirement community for active adults over 50. This mid-sized city has won awards including “One of the Hottest Tech Cities” – Newsweek, and “Best Town to Live and Ride” - Bike Magazine. Named by early fur trappers because of the woods along the Boise River, this city along the Oregon Trail was originally a support base for mining operations in the nearby mountains. This modern, prosperous, and livable city offers many recreational activities and a great lifestyle. 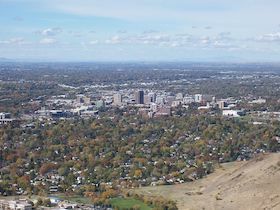 Boise is located in Ada County and is the capitol of Idaho. The North End, known for its artistic community, contains many of Boise's older homes. It is known for quiet neighborhoods right in the center of Boise, with tree-lined drives such as Harrison Boulevard. The Camel's Back Park and Hyde Park areas offer views and many small restaurants and businesses. Northwest Boise butts up against the Boise Foothills with an eccentric mix of old and new neighborhoods and is more affordable. Communities for active adults are being added. National Association of Realtors showed the Boise City/Nampa median home selling price at $263,800 during the fourth quarter of 2018. Its location on a high desert plain in southwestern Idaho near the mountains brings mild winters and low humidity. The Boise River offers an oasis to the deserts in the area. The average January temperature is 30 (F) and the average July temp is in the mid 70s. The Boise State University campus. Velma V. Morrison Center for the Performing Arts. The Gene Harris Jazz Festival is hosted in Boise each spring. Museums include the Boise Art Museum, Idaho Historical Museum, the Basque Museum and Cultural Center, Idaho Black History Museum and the Discovery Center of Idaho. Theater and dance groups include: the Idaho Shakespeare Festival, Boise Little Theatre, Idaho Dance Theatre, and the Boise Contemporary Theater. The crime rate is well below the national average. There are at least 5 hospitals in Boise. I-84 and I-184 run through the city. A network of bike paths makes the city exceptionally bike-friendly. The Boise Airport is a major and convenient airport. Public bus transportation is provided by ValleyRide and the Boise Urban Stages (BUS).